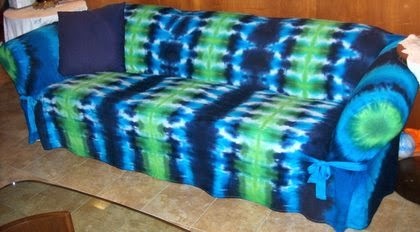 He later told me that he wanted to tie-dye his IKEA couch! It's a big L-shaped couch, and he got a white cotton slipcover for it (the great thing about IKEA couches is the availability of slipcovers). We got together at my place to work on it. It took about 4 hours to tie (separate pieces for each cushion plus the body), another 4 hours to dye, and another 4 hours to wash out. We went through nearly 2 gallons of dye! 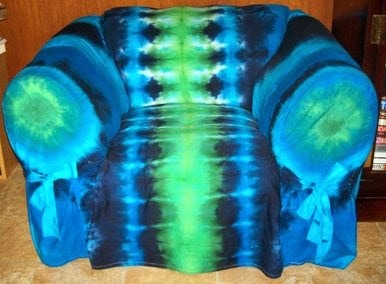 It's hard to see from the picture of the whole couch, but each seat cushion is a spiral. 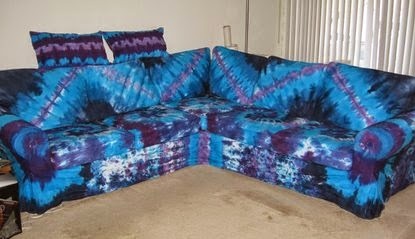 The couch looks even more fabulous in person than it does in the picture! 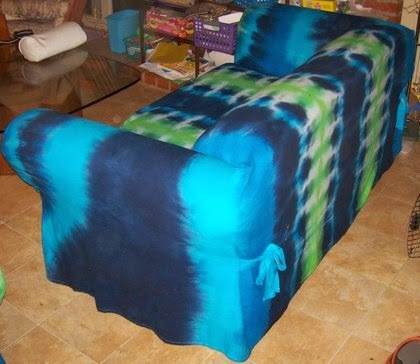 I liked his results so much that I got off-the-shelf slipcovers from Sure-Fit for my own sofa, loveseat, and chair. 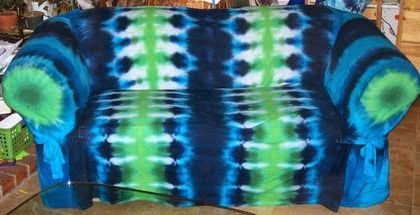 Like the first couch, this took about 4 hours to tie, 4 hours to dye, and 4+ hours to wash. 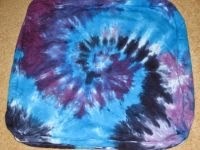 This project also took about 2 gallons of dye. Now I finally have matching furniture, and I love them! The green one above is a size M hoodie. It fits her fine, though she refuses to wear the hood (hey, I'm lucky she puts up with the clothes!). The blue one is a size M T-shirt from Dharma, by the way. It's definitely too big--she gets her front paws tangled up in the sleeves. 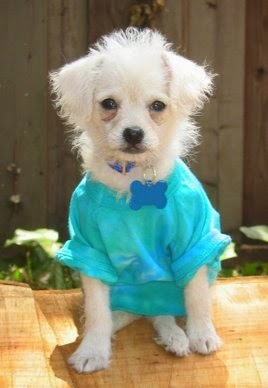 That's a size M ruffled dog T-shirt. I'm mentioning sizes and her weight because it's really hard to judge what sizes you need until you actually try it on the dog! She's a pretty leggy 8 pounds--thin chest and no fat on her--just fluff. 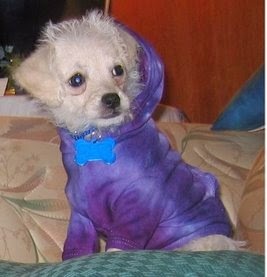 In the following picture, Lacey is 3 months old and weighs just over 3 pounds. This size XS Dharma t-shirt is a bit big on her, but the XS purple hoodie shirt fits her pretty well! Those doggie t-shirts even come in size 2XL! 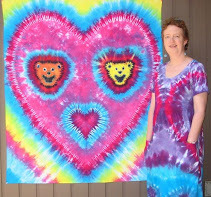 This giant schnauzer looks so handsome in his tie-dyed shirt! He weighs about 95 pounds.